New Yankee in Santa's Service is rated 3.5 out of 5 by 28. Rated 5 out of 5 by sundragons9 from Really fun and challenging After I played this, I had to pick up the other two New Yankee games. I liked all three. I'm often searching around for a new time management or strategy game that I haven't played yet, which is hard. I'd love to find more games like these as I'm not a fan of Hidden Object.which seem to have taken over. Rated 5 out of 5 by Night_Player_zz from Fun twist on New Yankee in King Arthur's Court Not really different from New Yankee in King Arthur's Court, but the characters are different. You feed the reindeer and they help protect your workers, the snowmen are destructive...and so forth. Santa and his helper elf are the two main characters of King Arthur's Court dressed appropriately for the season. All in all a fun twist on the game. Rated 5 out of 5 by kimbers55 from Great little game I enjoyed thoroughly, great holiday themed game. Rated 5 out of 5 by bwendyh from You better watch out! Better not pout! I really enjoyed this game. It started out a little slow but began to pick up as my trial went out. I will be buying this. Rated 5 out of 5 by kaca66 from a nice, cute game Just love it. So glad it is not Roman or medieval theme, although I have got the 2 previous games. Plenty of levels, some very hard, some easy but all gave me hours of fun. Yes, it is the same all thing collecting or building things, but this is 3rd in series and glad they kept the same goals but change few things like reindeer, snowmen etc. Love this Christmas theme and it s not over the top so I can still play it in summer time too. Rated 5 out of 5 by jendea from Cute, Christmas Fun Based on DEMO, I probably will buy. 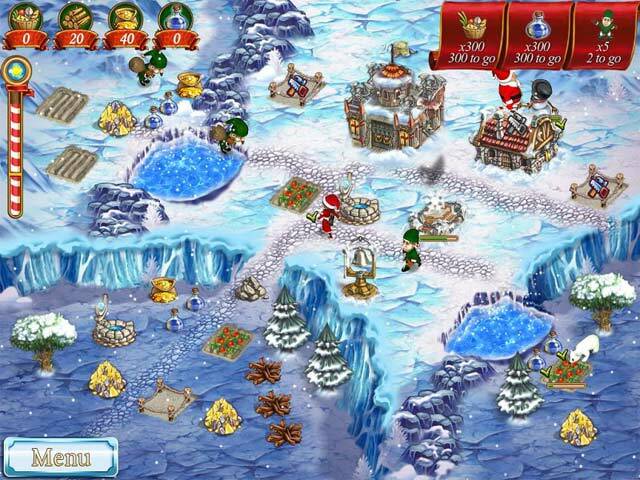 Very much the same feel as the original - harvest crops, chop down trees and complete the objectives before time runs out - with a seasonal theme! Pretty easy too. Rated 5 out of 5 by pennmom36 from I Could Play This Game All Day Long! Brilliant idea for a time management game. 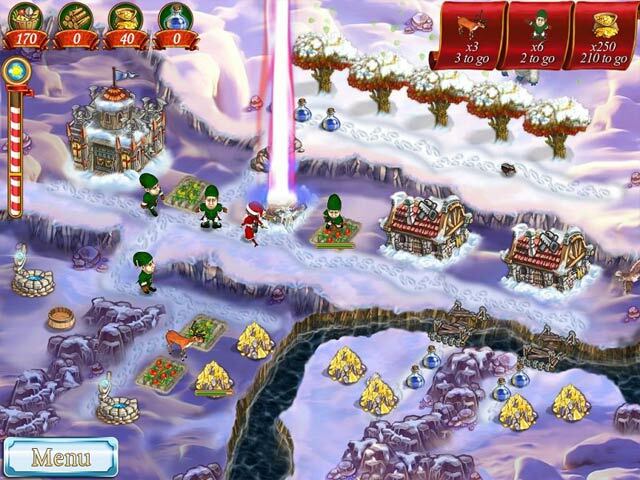 A misguided spell has taken you to the North Pole and scared away the Reindeer! 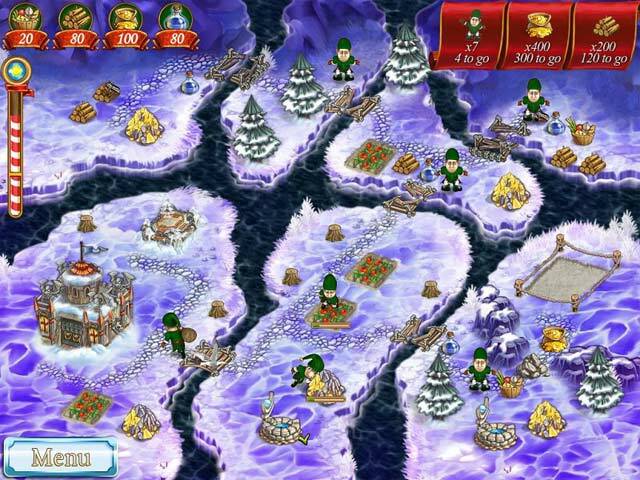 Now with the help of Santa's elves you will clear rocks and trees to free even more elves. You will plant gardens (snow gardens?) and try to harvest them before the hungry but slow polar bears get to them. You will need to scare away rabid snowmen that the elves fear the most as well as cast spells to grow trees and crops and collect manna potions to super speed up the elves. I honestly had a blast with this North Pole game, enjoy! Rated 5 out of 5 by petitpoissonnoir from New Yankee rescued Christmas spirit I really love this type of game! it helps to develop skills in planning moves and working out a strategy to complete. Graphics and storyline are nicely done. You will get your money worth.